1credit: Break any number of sentry subroutines. Use this ability only by spending a credit from a stealth card. 1credit: +7 strength. Use this ability only by spending a credit from a stealth card. Small. Compact. Easy to slip by monitoring programs and it can do some damage. This card is misleading. It looks small. It is not. It is big, in all the ways a breaker can be "big". It is big in set-up time. Unlike its counterpart Dagger, it requires a minimum of two stealth credits to function. If the corp puts two sentries on the same server (say, Swordsman in front of Cortex Lock) it requires a massive FOUR stealth credits to get in. This means that simply running Cloak and Ghost Runner isn't enough, at least not long-term. You are going to have to put in Silencers. Which brings us to the next element of bigness-influence. If you import three Cloaks into Criminal, that will already run you 6 influence, and if you try to add Lockpick and Refractor to the mix you can rapidly lose control. On the other hand, if you try to put even just one Switchblade and two Silencers into Shaper, that's 8 influence. And in either case, you still haven't yet splashed for a fracter (either Corroder or BlacKat). But lets say you pull it off, you get your Cloaks and Silencers running so you're firing your Switchblade every turn. Then we see the last way that Switchblade is big--it absolutely murders ICE. Two stealth credits lets you break every sentry in the game (except for Janus 1.0, which needs three). Compare that to another "big" breaker, Garrote. It costs Garrote 4 to break Tsurugi and 8 to break Archer. If you phrase that as "two or four clicks on a Magnum Opus", it becomes immediately obvious how much of a challeng these pieces of ICE are to that breaker. But if you have two Cloaks, you can break that Archer every single turn without ever needing to click for credits. Wait, though. A challenger approaches--the first stealth breaker ever, Dagger. Dagger is in a smaller weight class; it's medium, not big. It only needs one stealth credit to break most ICE in the game, meaning you only need one Cloak to be able to start checking ICE safely. It's in Shaper, meaning you don't need to spend influence if you're playing stealth out of that faction. And, in exchange, it's not as efficient, still operating on a pay-per-subroutine and +5/stealth strength boost instead of +7/stealth. These inefficiencies only come into play in two places, though. The first is against ice with 3 or more subroutines. 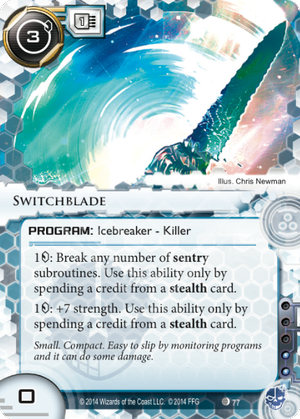 Most runners would agree that 1 stealth credit is worth at least 3 non-stealth credits, so it holds its own or breaks even with Switchblade on any ice with 3 subs or less. The other place is against ICE with exactly 6 or 7 strength--places where Dagger needs a double-boost and Switchblade needs only one. The intersection of these two points is Archer--it costs Dagger four non-stealth credits more than Switchblade to get through. It's a tradeoff, and not one with a universal answer. Maybe Dagger's faster setup lets you snag the Astro off R&D that would have lost you the game. But maybe that extra cost on Archer keeps you out long enough that you can't steal The Cleaners, or doing so makes you broke enough for Midseason Replacements to tear you apart. Tried this in a Smoke Stealth deck and it fell flat on its face when I realized just how difficult it was going to be to break subroutines. Sure, pumping up to +7 to slash down Archer is neat. Sure, a single credit per subroutine is normally affordable. But even with a Smoke-Mercur-Cloak-Runner econ, you're going to find it often extremely hard to come out of the exchange without a little bit of damage. The main thing is: for those two influences, can you possibly replace it with Dagger and more econ or silver bullets? Especially in a 40-card deck, that is an extremely pressing consideration.